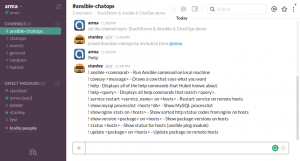 You are here: Home / Blogs / ChatOps – more Ops? In the recent years we observed several movements inside of Corporate IT – DevOps and NetOps are two big ones in my experience. Probably there are more. While the definition of those is constantly changing depending on who you talk to and what time of day. Recently I came across a new term – ChatOps. When I started looking in the term – the memory of my first exposure to that just resurrected – VMworld 2012 first day Keynote – you can watch it here at 1:20:50 Ravi Soundararajan demonstrates how VMs are making friends (demonstrating connectivity pattern) and like error messages to show the magnitude of the event. It looks like Ravi’s idea didn’t get too much momentum in 2012, however it came back now under new term called ChatOps. With powerful API driven tools such as Slack – the limits what you can do are pushed far away. My current job includes monitoring Slack all the time, we collaborate internally within company, with customers, based on project, receiving and reviewing alerts from other systems, getting my calendar updates and reminders, making and categorizing notes – all in one place. Now let look on modern Service Oriented Architecture or Microservices. (some may argue that this is two completely different terms). For purposes of this post I use the term interchangabely to explain API driven application where UI is autonomous piece that generates API calls for any interaction with the application. That allows integration with any other API-based management, scripting and automation tools. Now we can interact with Application using a bot. 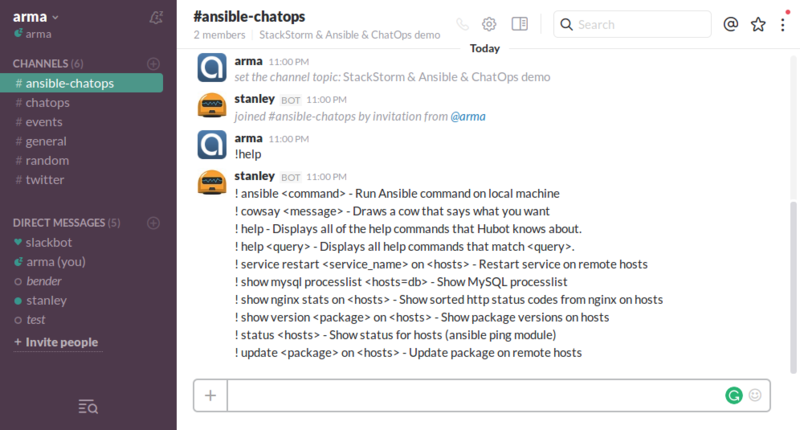 Yes it’s just another tool to manage your application, but if you already spend 80% of your time in your primary chat application, if you’re tired of clicky-clicky interaction with the systems that you manage and find CLI too much hassle, then ChatOps can help you with majority of your daily tasks. And it’s two way street – you get notifications but you also can execute commands, or even series of commands that would form an operational task. It’s interesting to watch where ChatOps are going. Knowing that it didn’t die since 2012 VMworld announcement – it means it has it traction and interest and with recent adoption of API-driven chat tools and applications it can be a big part of Datacenter (or Cloud) management future.